From the far end of the pool, guests at RH-1 can see portions of the pump house, cabana, fire pit, outdoor kitchen and the house itself. Though it suggests some sort of cutting-edge robotics project, "RH-1" is actually the nickname of a recently renovated private home in Chesterland, Ohio. It does not involve robots, but it is certainly cutting edge - Gregory Mata, owner of Cutting Edge Decorative Concrete, saw to that. Mata's client has done pretty well for himself and his family. A young, successful and energetic CEO, he purchased his Chesterland home a few years ago, and when the time for renovation came around, he called Mata, who'd done some work for him a few years earlier, to quote a stamped concrete patio. Simple, right? Think again. "(It was a) struggle to come up with the right design based on the products available," says Mata. "It didn't seem like anything was hitting the mark." Little wonder - the client's mark was a small, and sometimes moving, target. Throughout the course of the project, which soon far surpassed just a patio, nothing standard would do. "With every bit of what we were doing on this job we were being asked to increase the level of difficulty," Mata says. Everything had to be new, one of a kind, never before seen. But while the client was demanding, Mata says he was also incredibly enthusiastic. As the design deliberations for the patio went on, Mata and the homeowner discussed more and more of the things that could be done with decorative concrete. As the owner learned, he began going to his project manager to try and incorporate more decorative work into the exterior spaces, says Mata. That enthusiasm was what made the project such an exciting one to work on, Mata says. "We picked up such a great energy from him - he really inspired you to do your best. It's just exciting to have someone so pumped up, amped up to do something cool with concrete." 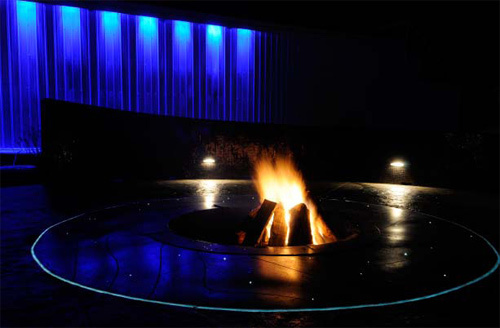 The fire pit and its fiber optic lighting, switched on at night. So, with the patio still in a holding pattern, the client found other ways the Cutting Edge crew could put their talents to good use. RH-1 as a house is unbelievably high-tech, says Mata. "Everything was the coolest of the cool." The home features club-quality sound systems, a state-of-the-art underground home theater room, and a two-story glass and steel master bedroom, reinforced to support the rooftop helipad. "Everything was so over the top," says Mata, and that theme carried over into the exterior living spaces as well. Take the fire pit, for example. The owner had a tribal sun tattoo motif that he wanted to incorporate into the elevated fire-pit area, which was about 30 feet in diameter around a 6-foot pit. After a great deal of discussion and brainstorming, Mata had a plan. The sun design began with the decorative metal grate that sets down over the pit. Then, around the pit, Mata installed a 3-foot-thick ring of polished black concrete with exposed black glass aggregate (which, he says, is a great high-end finish - the client liked it so much he had Mata do his front steps in the same style). As a border for the black ring, Mata sunk in a ring of fiber optic lighting. Moving on to the sun motif itself, he diamond-ground it into the surface and hand-stained it with black and bronze. But he didn't stop there. Mata picked up the pattern with 1-inch square glass tiles in copper and bronze, which carried the design out even further. Ultimately, it reaches up the concrete retaining wall at the back of the pit area. That level of complexity and detail was the rule for this project, not the exception. Walking through the exterior spaces, Mata says, is not a matter of moving through discrete areas - i.e. the patio, the courtyard, the cabana. 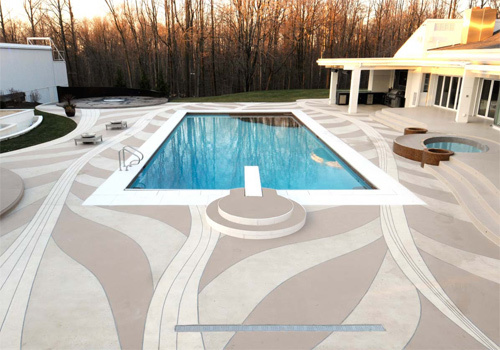 Rather, the entire space is one constant design, with a unique decorative concrete feature every 10 to 20 feet. The consistency of the design is due, in part, to the fact that the look evolved organically throughout the building process, and each piece of the project was adapted to suit. "As we're building this thing, there's no set design," says Mata, "no set plans." While that gives the space a very natural feel, it also made the process that much more challenging. A prime example of this can be found in the 35-by-25 cabana area, tucked behind a concrete water feature and filled with sand. Mata and his crew had poured the foundation and were getting ready to move on to the next step when the owner had an idea: Wouldn't it be great to build an underground vault and mount two 60-inch flat-screens down there on hydraulics? Then, at the push of a button, they could rise up out of the ground, and they would swivel so you could watch TV from wherever you were in the cabana/pool/patio area. It would indeed be great, they decided, so Mata and his crew set to work ripping up part of the foundation to accommodate the TV vault. 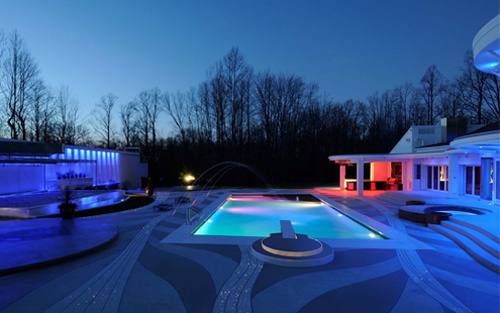 The pool area with all of its design features operational, including fiber optic lighting. A privacy wall at the house was built out of empty shipping containers. Another dramatic evolution in the project was the client's solution to ensuring his family's privacy. While the house is set on quite a sizable lot, you could still see one neighbor's house from the giant glass bedroom suite, and that was a problem. After considering a 16-foot concrete wall built with custom form liners, the owner came up with an even less conventional approach - four empty shipping containers (the kind you see on cargo ships) welded together, finished in clean white paneling, and mounted, thanks to Mata, on 36-inch-diameter concrete pylons and an 8-foot concrete foundation. The containers not only won the client his privacy, but the resulting indoor space, a 140-foot tunnel, could be used both as a track for riding his four-wheelers and as a fully functional stage for the patio area. Mata and the Cutting Edge team came in to quote the patio for RH-1 back in October 2007. After a year and a half spent working on other parts of the spread, it was finally time to actually build a patio. One of the designers came to Mata with a picture of a polished terrazzo interior floor from South Beach, Miami. Was there some way they could do the design as an exterior? Mata's motto for the job was, "Never say never." "It was a huge challenge," Mata says. "We came up with something never before seen." To get the look of a subdivided terrazzo floor, Mata sunk metal divider strips between the (many) different panels of the patio surface. Some of the longer, slimmer bands in the pattern he packed with fiber optic lighting. Others took exposed aggregate - white and chocolate glass, mother of pearl, Italian white marble. The design incorporated a multitude of custom mixed and colored concrete, all placed by hand. But the real challenge was not in the design, but in the technical precision required to get all of these separate sections pitched just so to allow for proper drainage. A wide-angle view of the pool as dusk approaches. Mata and his crew finished the final pours on RH-1 two days before Christmas 2009, racing the oncoming snow. Completing the project took every bit of the concrete knowledge Mata has amassed in his career, and it consumed all of his company's resources for two whole years. But, says Mata, because of the client's enthusiasm, it was all worthwhile. "It was fantastic being so appreciated," he says. RH-1 was not only a dream job for Mata, but it was his client's dream house too, and that comes across when you see it, he says. "I don't care who you are or what's going on in your life - (when you're looking at this project) you're grinning from ear to ear. We built the whole thing and I still couldn't help but stand there grinning." What more can you ask for in a job?